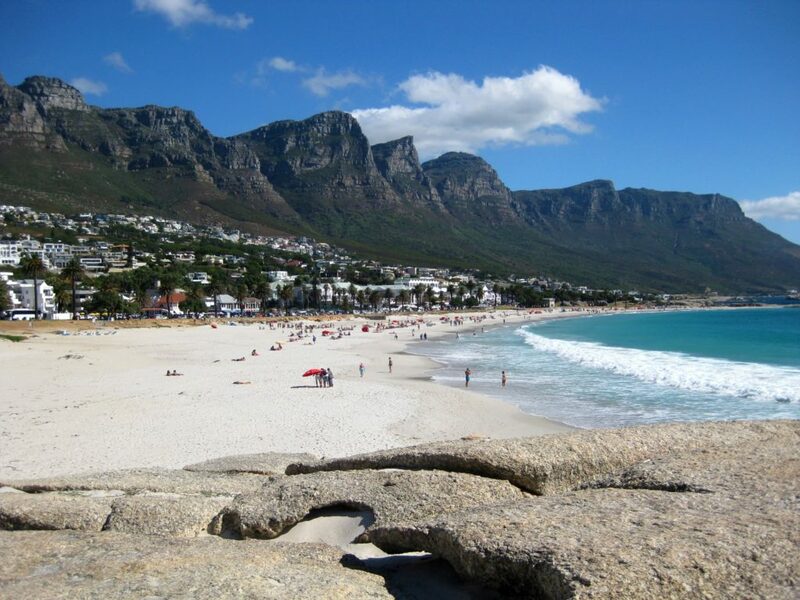 Cape Town - Experience the variety of South Africa within two weeks. It was the end of January when my girlfriend and I were waiting on our train in the train-station. On this late afternoon in January a cold day was coming to an end and we definitely felt the approaching ice-cold night. It was the end of a working day and people with their blank and pale faces only had one goal: getting to their warm homes as fast as possible. We stood there. Dressed in warm clothing to be protected against the cold winter air. We stood there with our suitcases and waited to flee this nasty weather and to leave the everyday life behind us. 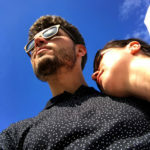 We waited on finally being able to start our long planned trip to Cape Town, South Africa and that day had finally come. We stood there. We waited and surely we were the only people on January 24th that had a smile on their faces. We booked a direct, over-night flight with Condor so we arrived in Cape Town around 11 am the next morning (in winter there is only one hour time difference to Germany, in summer there is no difference in time). A private shuttle service that was organized by the owner of our apartment in Cape Town, Bruce, picked us up at the airport and took us to our Hotel for only 15,- €. The transfer was organized ahead of time by our landlord who has been helpful throughout the whole trip to South Africa and even in the time before even getting there he answered all our questions. We arrived at Rose Lodge around noon to check out our room. Here we were warmly welcomed by Amanda who taught us our first steps on South African ground. 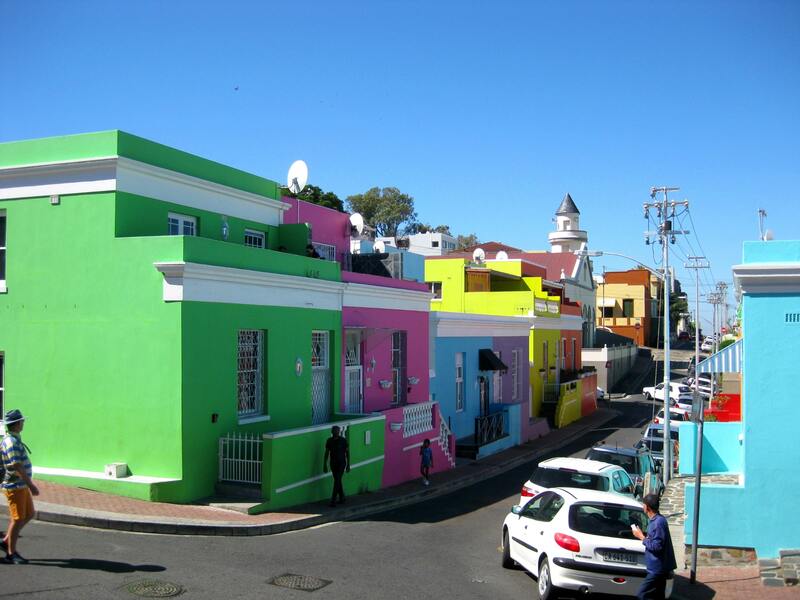 The Rose Lodge is ideally located in Bo-Kaap, the neighborhood with the famous colorful houses that you might know from various advertisements, and we booked it for 14 nights. Breakfast as well as the price for our stay were unbeatable. The great thing about the breakfast was that we could basically show up whenever you want throughout the day because it was always prepared the night before by someone of the Rose Lodge Team. The accommodation only had two more double rooms that we shared the kitchen with. That kind of gave it the feeling of sharing a flat and made the stay more personal – very special charm, we liked it. 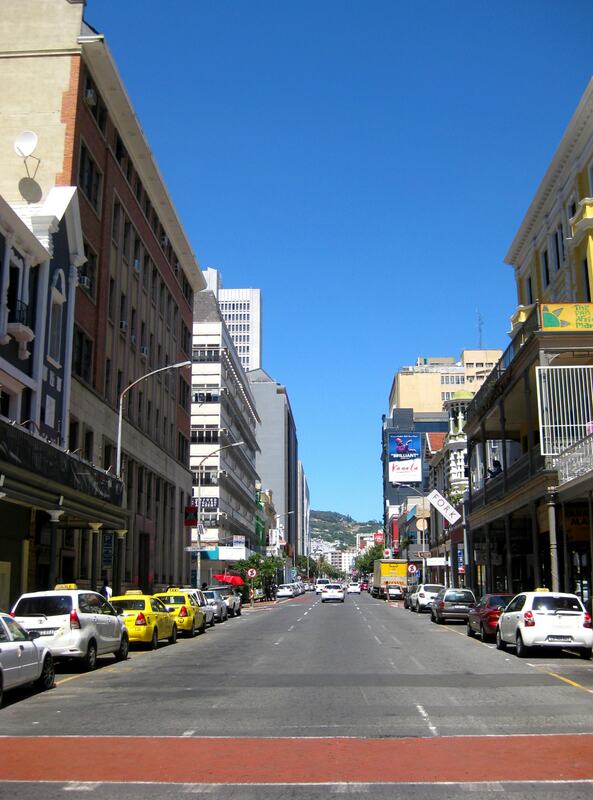 After the first impressions of our accommodation for the upcoming two weeks we decided to take a walk to down town and along Long Street (that is famous for its numerous bars and restaurants) to get an overview of the area and acclimate ourselves. During the German winter-months the weather in Cape Town is amazing offering the ideal possibility to experience warm summer temperatures up to just blank heat – and all of that without jetlag! As a tourist, you have to be prepared for the strong wind that makes you forget about sunscreen throughout the day (the coolness of the wind will cause you to underestimate the force of the sun down there) and forces you to carry a jacket at nighttime. Towards the end of our little walk we bought a few little things in the supermarket (Kwikspar) and chose the Royal Eatery for dinner. 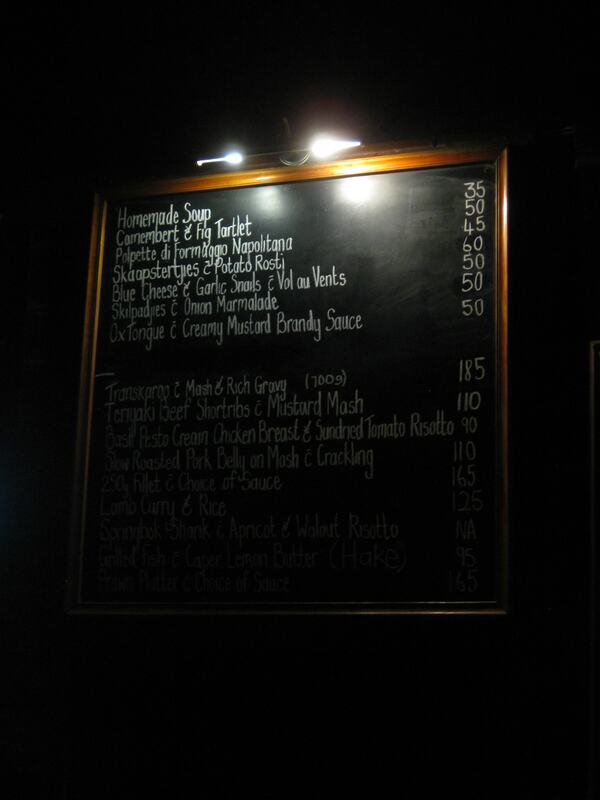 Here, for the first time, we noticed the relatively low prices for eating out. Two awesome burgers and some cold drinks didn’t even cost us 20,- €. Before really being able to start our activities that we had planned we had to find a (preferably cheap) way the get around Cape Town. We checked that out from home before leaving Germany already and decided to take the MyCiTi bus to drive from A to B. Therefore we bought reloadable MyCiTi-cards (they look like credit cards) at one of the bigger bus stations and each put around15,- € (converted) on it. And here is how the cards work: When you get on the bus you hold your card on a terminal that is located next to the bus driver. When you get of the bus you do the same thing. So you only pay for the actual trip you take. This concept is awesome but has its boundaries. As soon as there are a few more people that want to get on the bus the waiting time to actually get on elevates quickly. Throughout those two week we used the MyCiTi bus daily and didn’t even get close to actually use up the 15,- € we put on each card. To get around Cape Town, that’s definitely the way to go. Note: You cannot buy tickets from the bus driver. If you want to use the MyCiTi bus you have to buy the card. After getting this organizational stuff out of the way we could finally head for our first destination – the beach in Camps Bay. Once we got there we rented two sunbeds that were placed on the beach according to our liking by the guy renting them out. After that we simply enjoyed the magnificent view onto the water, with the back of the Table Mountain facing our backs. At this point we really want to emphasize the importance of sunscreen, that should also be re-applied regularly. It is not just a slogan when people down there tell you that the South African sun is merciless. We had a great time at the beach that day. The only annoying thing were the “artists” that were trying to sell you their pictures and souvenirs as well as the ice cream and cold-drink salesmen that relentlessly took their trips up and down the beach. Once you tell one “no but thank you” the next one is already approaching. At first it felt like we were being attacked by a swarm of mosquitos. After some time though we started to ignore the salesmen and didn’t even bother to decline with thanks. The day was coming to an end and the packed our beach bag and headed back to the accommodation to freshen up for the evening. 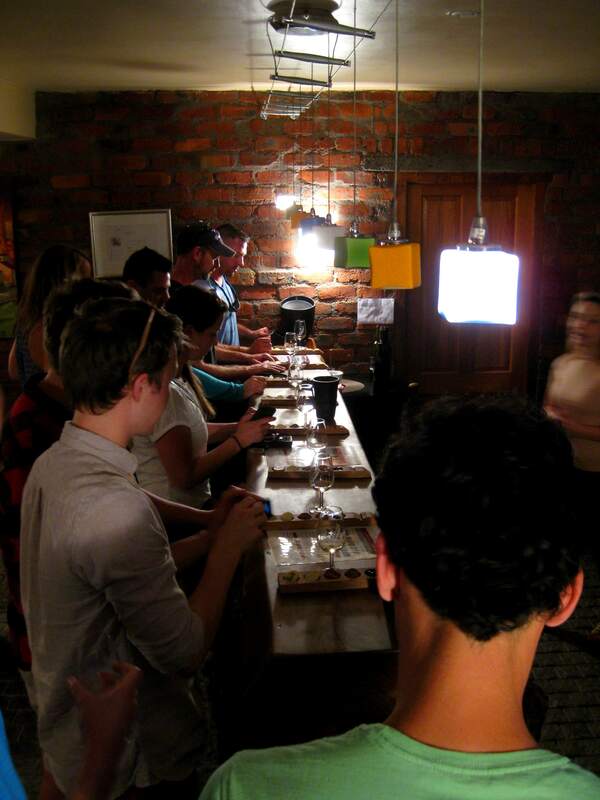 This time we chose the BEERHOUSE on Long Street. We had some tasty food and tried a few beers from the huge beer-menu. 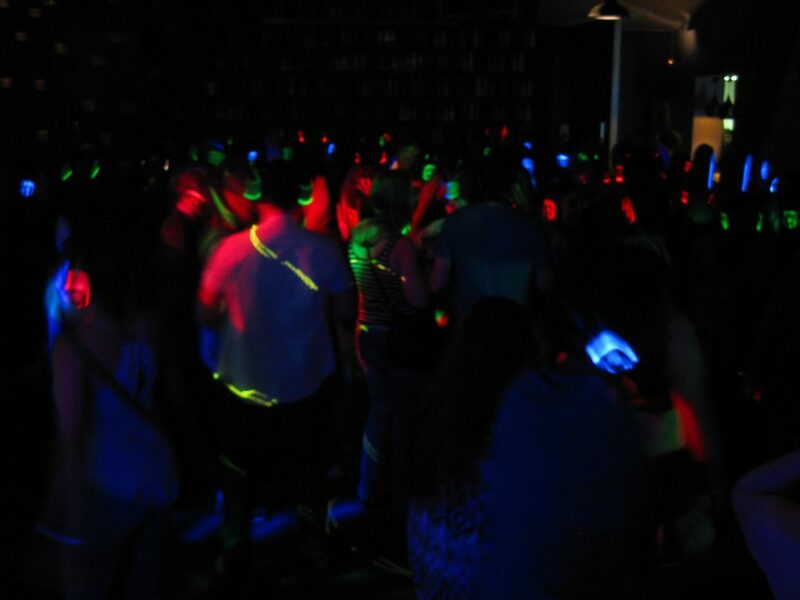 The highlight of the evening was the “Silent Disco”. Guests could rent headphones on which you could choose between three different channels, each channel playing music from another live DJ. Every one of the three channels were indicated by another color so you could tell who is listening to which channel by the color of the light on the headphone. The later it got, the dancefloor filled up with more and more people and became a colorful party. We had an unforgettable night and lots of fun. When it got really late we took a taxi cab to get back to the hotel. Here we recommend that you really take a taxi cab when it gets dark and don’t walk in the dark. We didn’t have any bad experiences but you shouldn’t be pushing your luck. Our first (and only) negative experience happened on day three already – to give it a positive side. To be honest – the whole day just sucked. During our research at home for the trip we booked tickets online ahead of time for the trip to Robben Island because they tend to sell out, so you cannot really take a spontaneous trip unless you are super flexible in your schedule. The day of the trip we decided to take the bus to the harbor – De Waterkant. That morning we also learned to not underestimate the traffic in Cape Town. Because in the mornings and evenings the streets are just packed. We arrived rather late at the waterfront and had trouble finding the gate where our boat was supposed to leave. We also underestimated the distances in the waterfront area and did not make it to the gate in time. Luckily we were able to get tickets for the trip in the afternoon the same day and spend the day around the harbor. While buying the tickets for the trip again we noticed that we were not the only fools that missed the boat that morning, but that only made the mood raise a tiny little bit. Anyway, that way we had some time to take care of our sunburns from the day before and realized the extent of the burns. This day the weather was not on our side as well. It was the only day with rain and some cooler temperatures. Finally, the afternoon came and this time the boat did not leave without us. Once we reached the island after a 30-minute boat ride the group was divided on several busses that drove us across the prison island. Each bus had a tour guide that gave us all the information about the island during the drive. Afterwards we stopped at the actual prison and walked through the different buildings of the prison, passed Nelson Mandelas’ cell amongst others and got some interesting insights in the past times. Maybe the whole trip was just ill-fated. We finished up the day by having dinner in one of the numerous restaurants in Waterfront and afterwards fell into bed, completely worn-out. 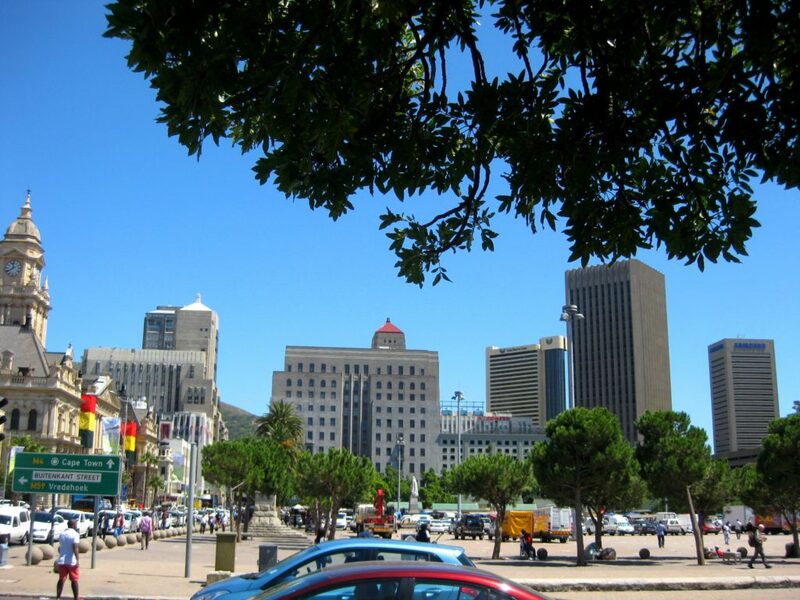 After taking in our first impressions of Cape Town we decided to do the Hop-on-Hop-off Tour by City Sightseeing on two subsequent days to see even more of this beautiful town. The busses stop in multiple areas, you can take unlimited trips in one day and it is a convenient way to see a lot in a short time. 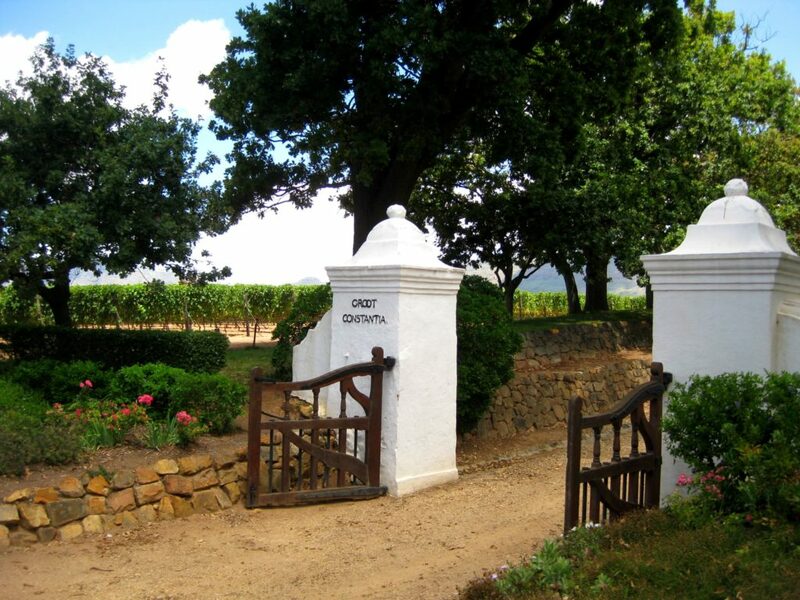 On day four we decided on the “Blue Route”, the “Yellow Route” to finally get to the “Purple (Wine) Route” and visit South Africa’s oldest vineyard – Groot Constantia. The “Wine Route” allows you to visit three vineyards and we had a wonderful time exploring this imposing wine area, located just around the corner from downtown. 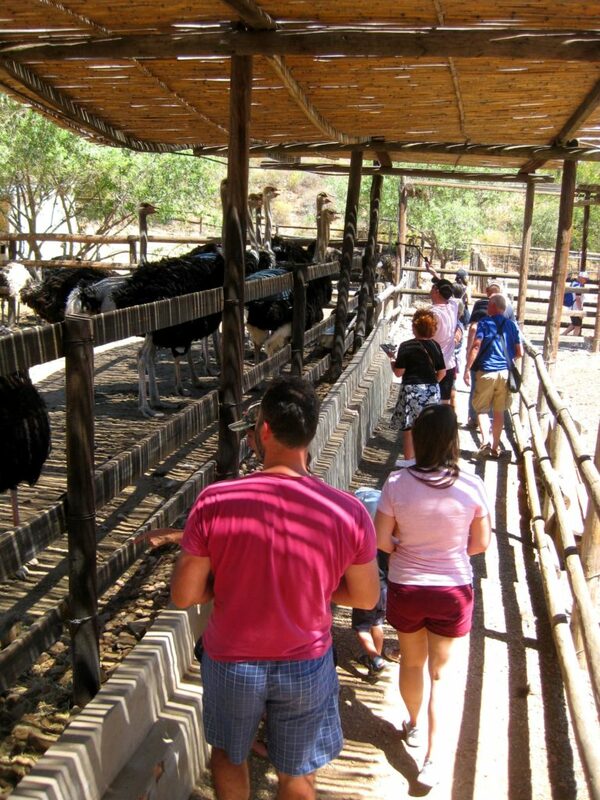 You can participate in wine tastings, a cellar tour and you can enjoy the beautiful nature. The day went by in a heartbeat and we took the Hop-on-Hop-off bus to get back to the city center to have dinner. This time we ate at SGT Pepper on Long Street. The restaurant was ok and the waiter was very friendly but the food was not that great. We ordered two pizza and they were both not so good. Nevertheless, the day took it out of us and we contently fell in bed. 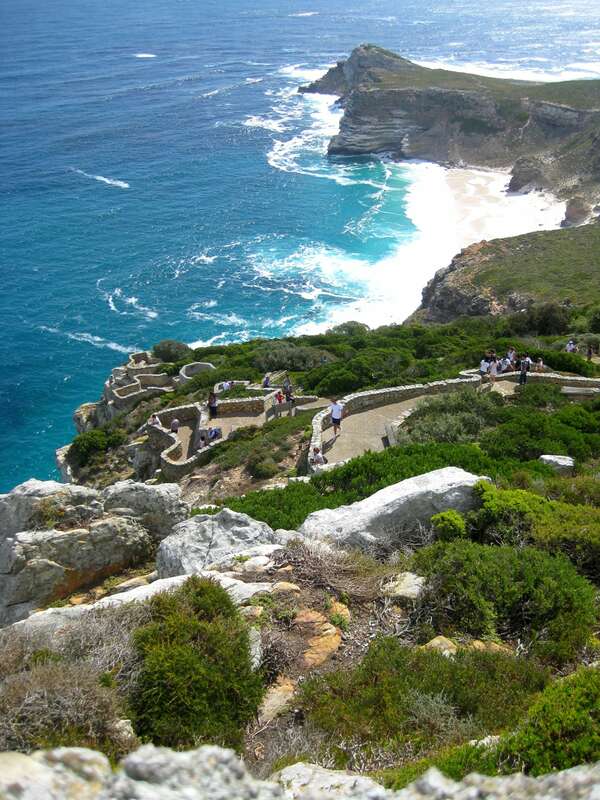 The second day of the sightseeing tour we went to Kirstenbosch, a botanical garden on the foot of the Table Mountain. It is recommended to get there early because it is more like huge nature reserve than a botanical garden and it will take you the whole day to explore. 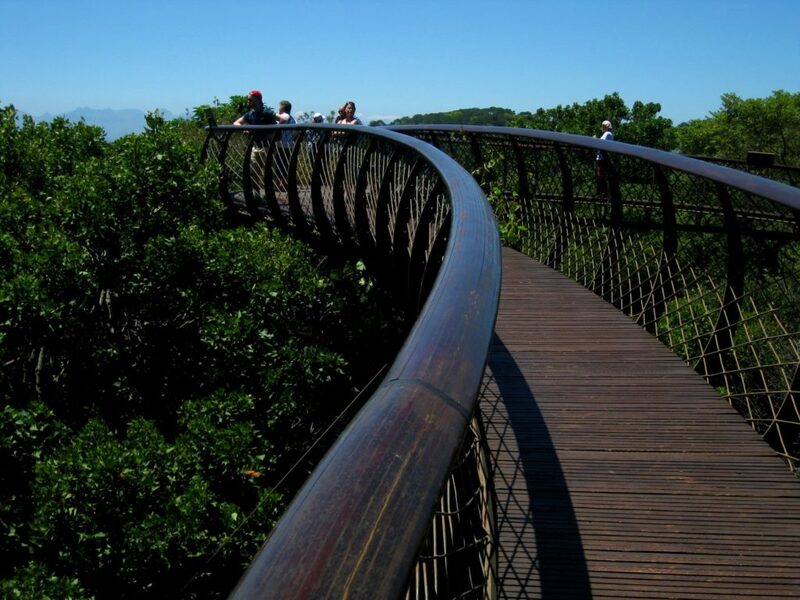 Next to a variety of plants and smells (and some birds) there is a nice treetop walk – very impressing. In the late afternoon, we went back to town (not quite easy when it is rush-hour and everyone just wants to go home) taking the route along the beautiful coast. For the evening we had planned to take the Sunset-Bus, which was included in the 2-day-sightseeing ticket. In time, the Sunset-Bus left from the harbor and was headed towards the top of Signal Hill. From up there we were able to enjoy a nice view over the city as well as the breathtaking sunset above the ocean. When the sun is down the bus took us back to the harbor and we took a taxi cab to the hotel. Make sure to dress warm though because the wind is strong up there and it gets really cold. With these five days the first part of our trip ended. We really arrived in South Africa, got a good overview of Cape Town and looked at the first sights. With the up-coming sixth day the second part (of a total of three parts) of the trip was about to start, involving our rental car. Early in the morning we walked to the car rental station (we booked the car from Germany through First Car Rental). After some papers that had to be filled out we sat down in our maschine – a VW up! Following that was the most unpleasant thing I had experienced thus far (maybe not as unpleasant as the situation when you fart in a full elevator, yet uncomfortable). We drove out and had to drive on the “wrong” side, the left side, right into the morning rush-hour of down town Cape Town. I have to say, every movement was uncomfortable; the shifting, stirring, looking over your shoulder, set the blinker – just everything. But we had no other opportunity than getting used to it and getting used to it quickly. Here is a spoiler though: we mastered our car tour just fine without any incidents and got used to driving on the left side. Our first destination that day was Boulder’s Beach in Simon’s Town. 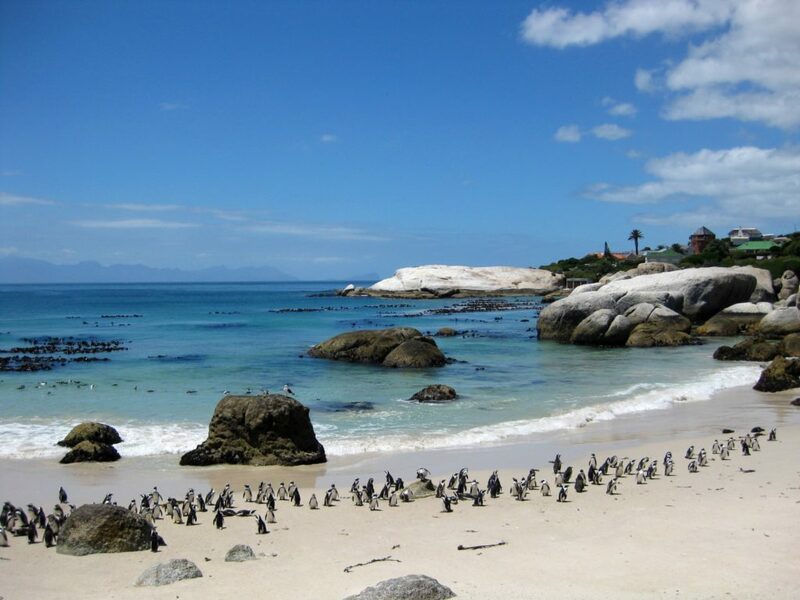 Boulder’s Beach in Simon’s Town is a home to a whole bunch of penguins and we had to see that. These animals are an eyecatcher especially for my girlfriend because they are so cute and do not have arms. 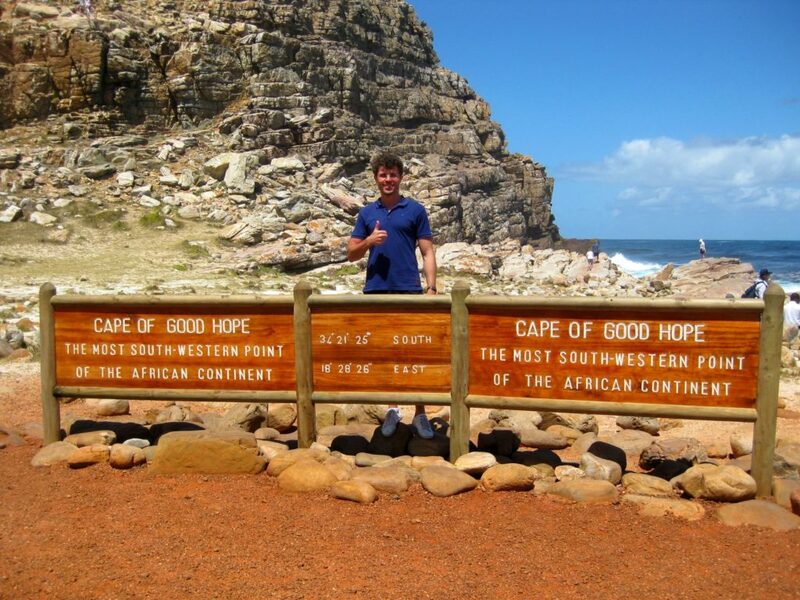 After this stop, that was heavily visited by tourists from all over the world, we kept driving on the cape peninsula toward the Cape of Good Hope. Far before you can even see the ocean you find yourself in a line of cars and have to pay an entrance fee for the national park. You do not have to leave the car to pay the entrance you just reach the money out the window or pay by card (just like the toll you have to pay on a few roads). As we reached the Cape of Good Hope and caught one of the few parking spots the first thing to do was checking if there is no apes around the car. These monkeys just hang out everywhere and pretend being not interested in anything, but they can be fast as lightning when they spot something edible. On the Cape itself it is obligatory to take your picture behind the wooden sign with the inscription “CAPE OF GOOD HOPE” before you keep going and climb on the cliffs. You should bring something a cap and something to drink though. Once you get up to the top you can enjoy a beautiful view over the ocean. Afterwards we went back to the car and drove up to the Cape Point and the lighthouse. You will find a restaurant, souvenir shops up and the station for a little cable car that takes you to the light house if you do not feel like walking up there. 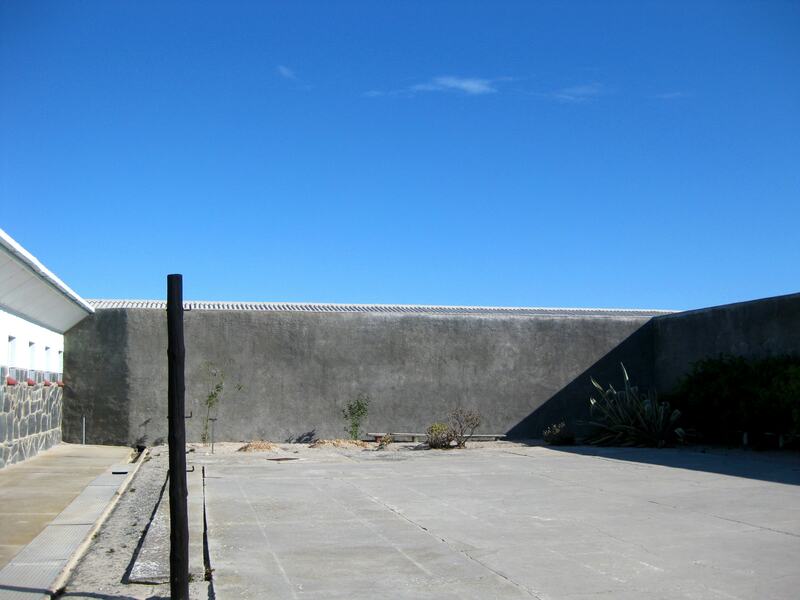 From the lighthouse, you will have another great view over the ocean, on a beautiful little beach and the nature of the cape peninsula. A few memory-photos later we went back to the car and went off to our last destination for the day – the Chapman’s Peak Drive. 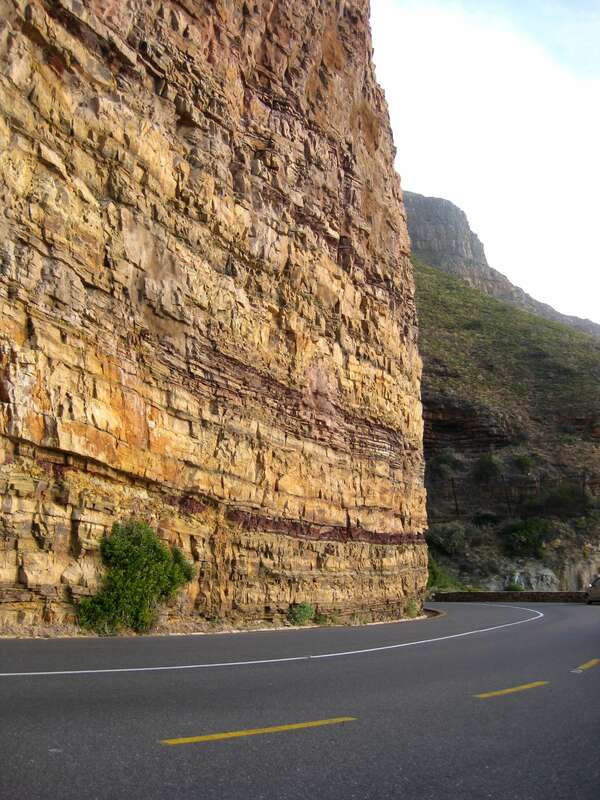 A street that was basically built into the mountain on the coast to Cape Town. We enjoyed the gorgeous sunset on the Atlantic Ocean before driving back to town to have dinner in Waterfront. That was going to be our last night in Cape Town for few days because we planned a 3-day roadtrip and wanted to start early the next morning. We drove around 150 km on our day around the cape peninsula but in the coming days we would drive 10 times as much. Parking in Cape Town is a little adventure in itself… The one who has the possibility should park their car in a guarded parking area and still don’t leave anything in the car. We parked our rental car in front of our hotel on the street. Right after we stopped the engine and stepped out of the car, an old, probably homeless guy, in a string-orange warning-vest, showed up out of nowhere and assured us of guarding our car for the whole night if we give him some money. We gave him 1,50 € and he went straight to his job yelling at people to stay away. This investment, if you want to call it that, was ok for the good belly feeling even though we knew he wasn’t really going to watch the car all night. But maybe he did, we don’t know. After breakfast we started our five-hour-drive to Oudtshoorn. We left Cape Town behind us, drove through the wine farming land (Stellenbosch and Paarl) until we spent most of the time driving through dry, rocky area. In the early afternoon we reached Oudtshoorn. Our hotel for the night was located approximately 20 km north of Oudtshoorn. The hotel De Oude Meul Country Lodge is located idyllically in the midst of green hills and was very tranquil. We have to point out the restaurant of the hotel where we ate ostrich meet for the first time. Interesting experience. After a very good breakfast we left De Oude Meul Country Lodge (we would have stayed there longer because it was a nice contrast to the hectic town) and drove north to the Cango Caves (limestone caves). 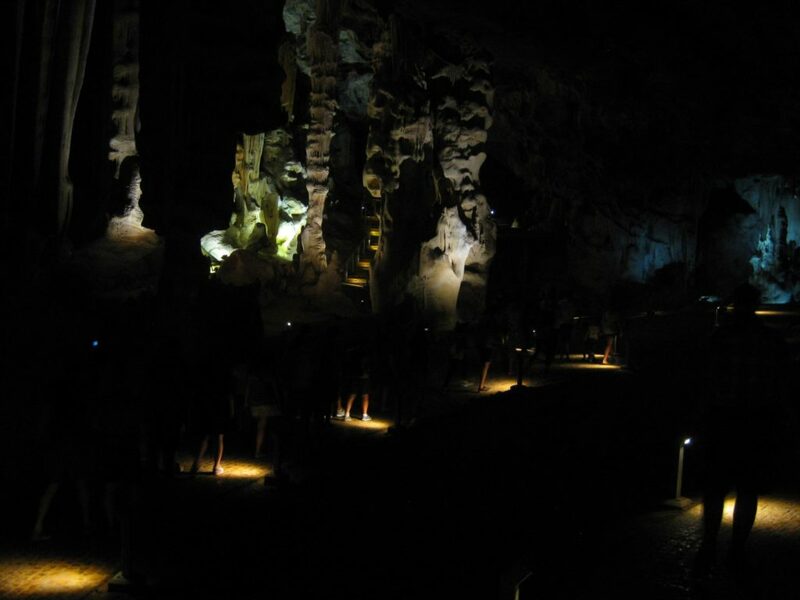 We bought tickets for a cave tour and were extremely lucky considering our tour guide that gave us a very entertaining and diverting (in order to demonstrate the great acoustics of the cave our guide sang two times – it was amazing). Here we booked a tour that we arrived for just in time. And again our tour guide did a great job. In multiple language she told us about ostrich breeding and the visitors were able to feed, pet and even ride these imposing animals. That really was an unforgettable scene. Even just standing next to an Ostrich, knowing that it can kill you with only one hit, was extremely exciting. In on-site souvenir shop we bought a few souvenirs and then drove south to our next stop, the Indian Ocean. 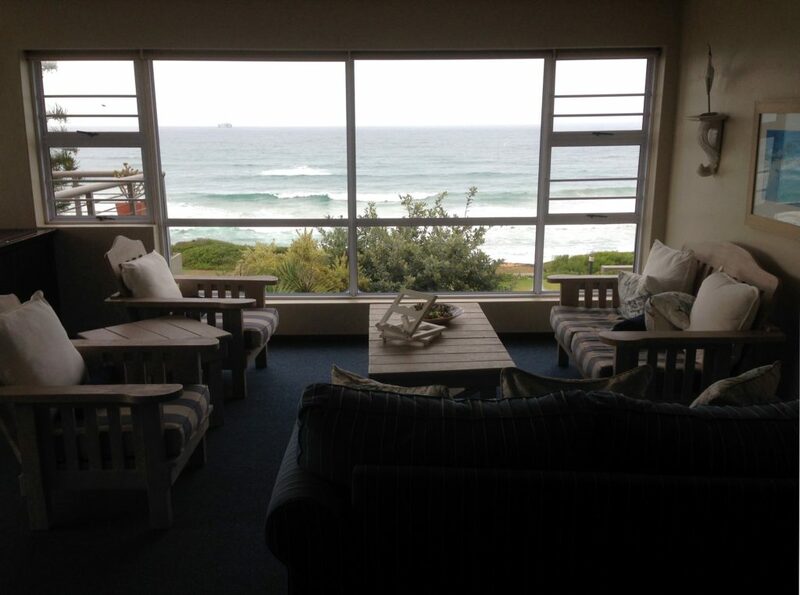 We reach our accommodation in Tergniet, close to Mossel Bay along the Garden Route, within two hours after a nice drive through a very diversified landscape. At this point we have to state that there is three ways to visit South Africa. First thing would be the north with its national parks and safaris. Second would be the south-west and Cape Town. 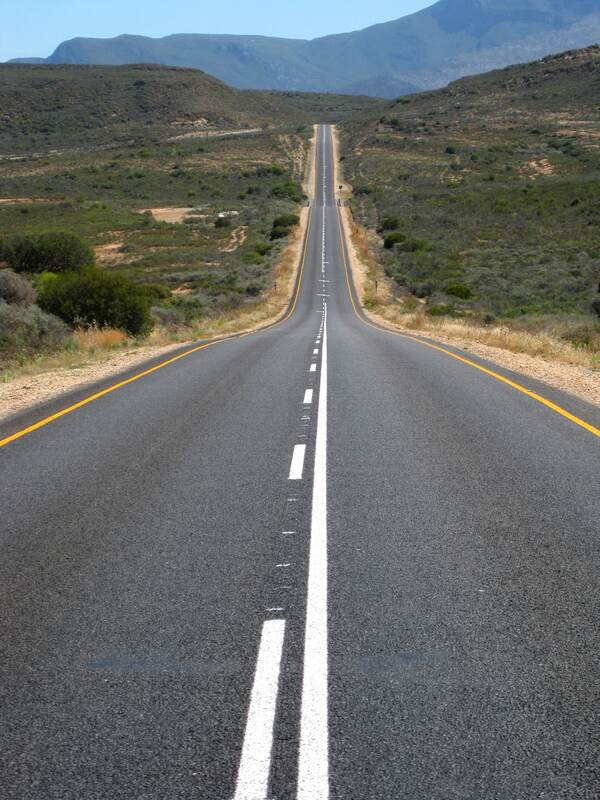 And third would be the drive between the two possibilities above along the famous Garden Route. There is something for everyone. The beautiful C’the View Guesthouse is located directly on the ocean and we had an awesome room whith a balcony basically on the ocean site. The very friendly lady that welcomed us recommended a restaurant and even reserved us a table. The Transkaroo blew us out of our minds because it was way more than we expected or even hoped for. The great ambience, the outstanding service and the extremely good food was not only a pleasure to eat but it was a very special stay and experience for us. After another very good breakfast we were headed back to Cape Town. 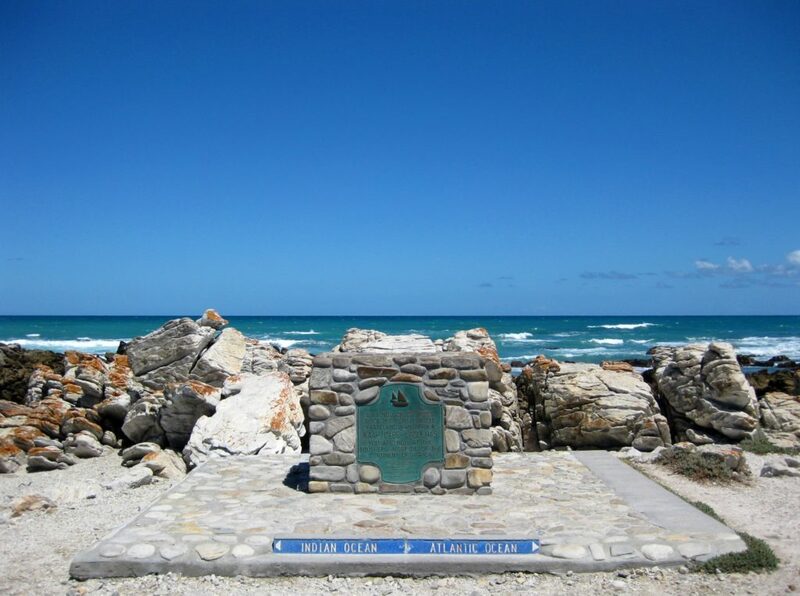 We decided to take a little detour though and stopped in L’Agulhas to visits the most southern point of Africa. Here the Atlantic Ocean and the Indian Ocean meet so it is a nice addition to the vacation album. L’Agulhas itself is a little, sleepy town with not much tourism at all. That allowed us to spend some relaxed moments on the coast before driving back to the lively Cape Town. Towards the end of the drive time was not on our side due to Cape Towns traffic but we managed to return the at exactly 18:00 h as arranged. We returned to the uraban jungle of Cape Town with a lot of new impressions and it felt like we were coming home. On that day my personal highlight of the whole trip was planned – climbing up Table Mountain. Before you can start walking though you have to follow the weather forecast closely (the Table Mountain website also has a weather forecast: www.tablemountain.net). On cloudy days and on days with a strong wind it can happened that the cable car does not drive so you might end up on top of the mountain in a cloud and you cannot get down or you might not even be able to get up there. We were lucky though because the sky was as blue as it can be without clouds and without wind. We took the MyCiTi bus to the station Kloof Nek and crossed the street to the station Lower Table Mountain. From there we hopped on the shuttle bus that took us directly to the lower cable car station. 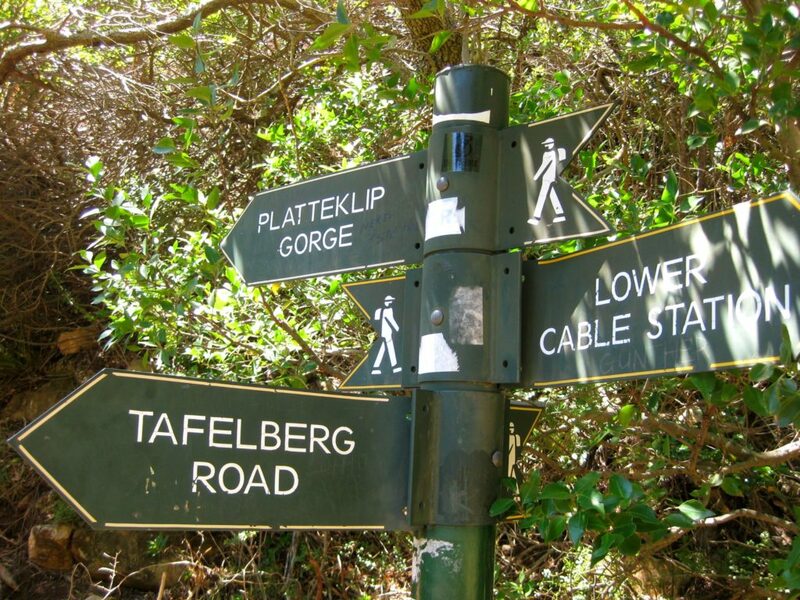 Since we decided to hike up we easily passed the extremely long line for the cable car and entered the path Platteklip Gorge. 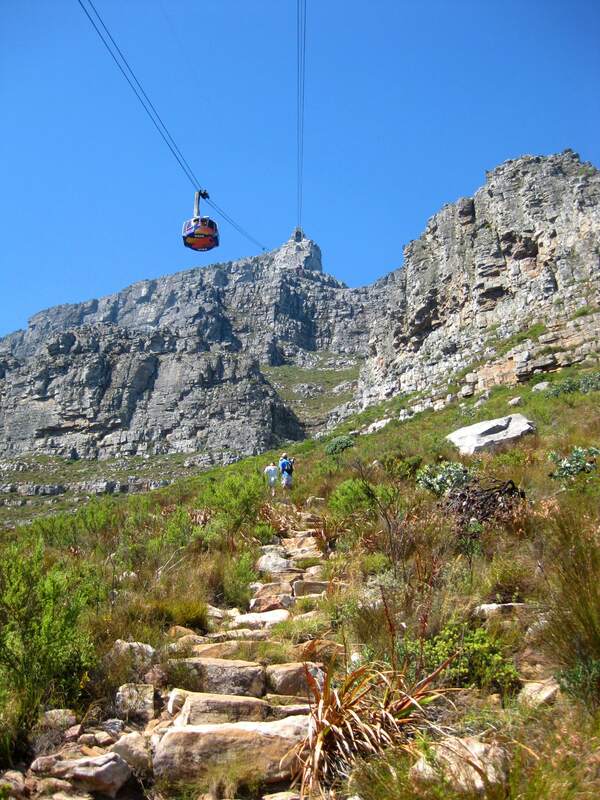 If you are facing the Table Mountain the path starts on the right side of the entrance to the cable car where the bus parking area is located and the first few hundred meters you walk right under the cable car. 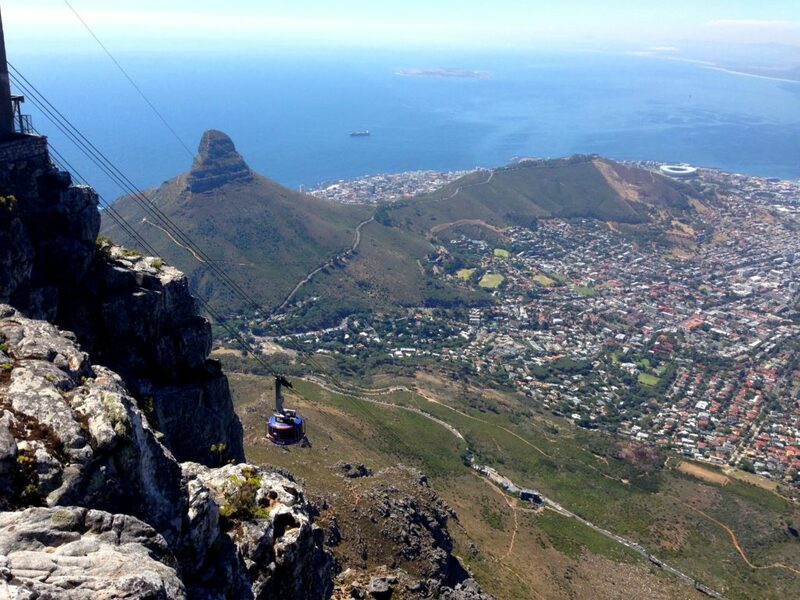 There are numerous possibilities to get up on Table Mountain. To us the option of walking up seemed the best because it was the easiest and also fastest possibility since waiting in line for the cable car can take several hours as well. 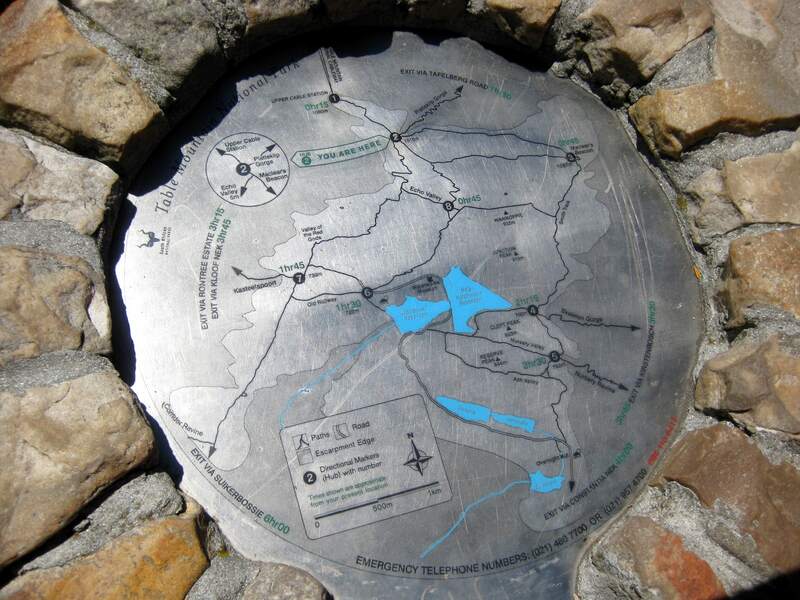 All paths are very well marked so orientation is not a problem even for the amateur-hiker. We mastered the 1000 m elevation gain in a good and relaxed 3 hour hike. This feeling when you reach the top is just indescribable and feels relieving in a way. Once you are on top you have two possibilities: Walk left and approximately hike another 2-3 hours around the plateau or you go right toward the cable car station, the restaurant and the café. We picked the second alternative. The view was bombastic and even though I imagined the top a little different (I completely underestimated the size of the plateau) the impressions are unforgettable. It was already afternoon when we got in line for the cable car to take a ride down (we bought the ticket to go down directly at the upper cable car station without waiting in line at all). The first clouds started to build up literally right next to us and one we made it back to town the top was covered in clouds. For the evening, we picked a restaurant close to our accommodation and found BOCCA – an absolutely stylish restaurant with a special flair, that was more than appropriate for that special day. 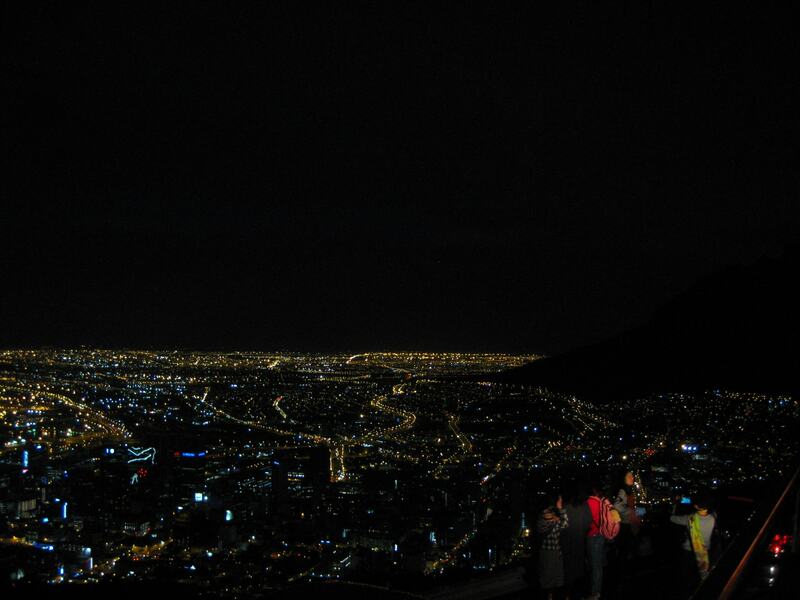 Because we climbed the Table Mountain – awesome! After the hard labor the day before and the relief of having climbed the Table Mountain (as said before it really depends on the weather if you can go) we granted ourselves the first day without a set schedule and just go with the flow. We walked down town and strolled through the pedestrian area. 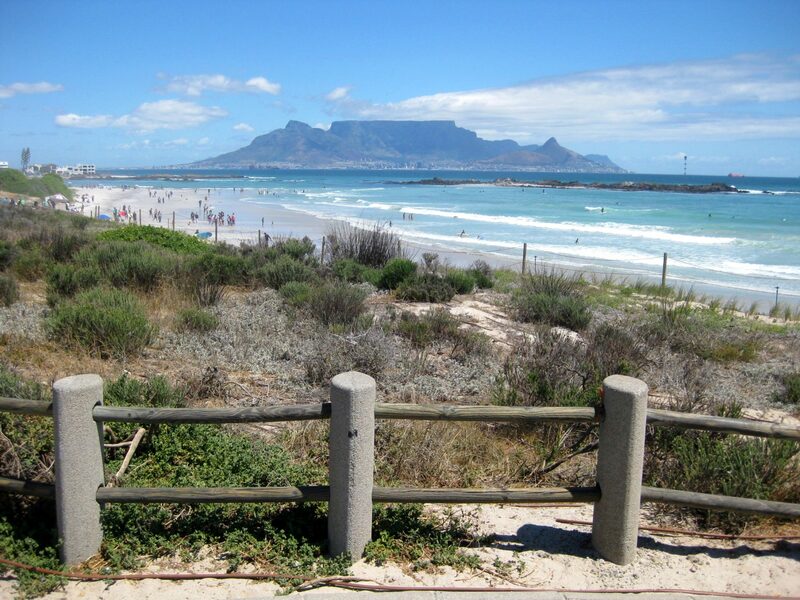 Needless to say, we had day goal which was visiting the Bloubergstrand that is located north just outside of town. From this beach you have the beautiful postcard panorama view on Cape Town with the Table Mountain in the back. 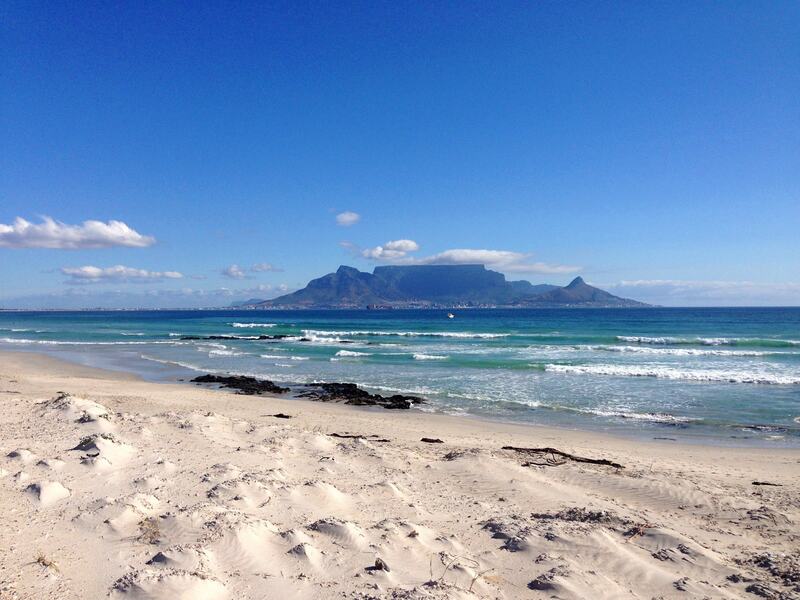 The Bloubergstrand is definitely worth visiting and easily reachable by bus. In the evening, we chose The Famous Butcher’s Grill that is located inside the Cape Town Lodge Hotel. Never before did I eat such a good steak for that little money. On one of our last days in South Africa we granted ourselves a day at the beach again. We learned from our mistakes and put sunscreen on multiple times throughout the day. We really did not do anything that day except for laying on the beach, reading and just day-dreaming. 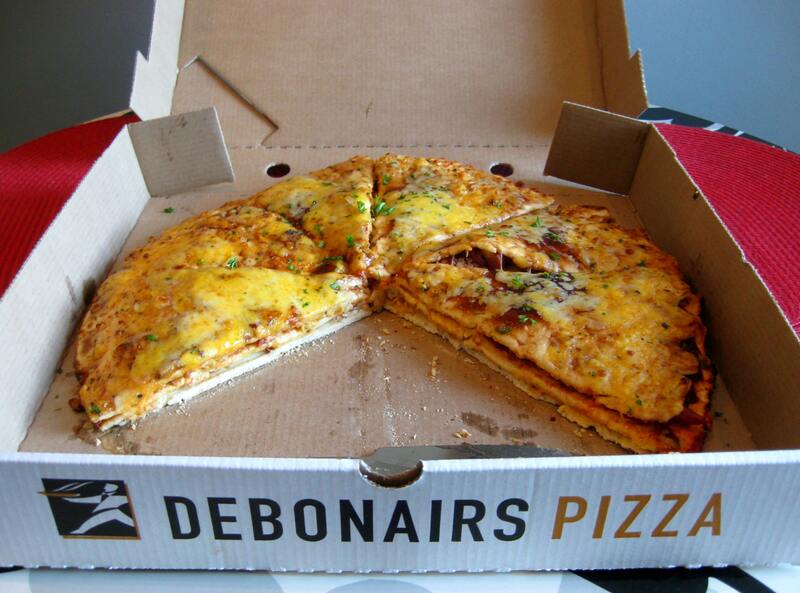 For dinner we tried the much-advertised Triple-Decker-Pizza – delicious! In a good story the arc of suspense drops after the climax (and the Table Mountain was the climax literally) just to raise again right in the retarding moment before the end (Aristoteles and my German literature teacher would be proud of me now I guess). This was the case on that day. Ahead of time we booked the Wine Flies Tour for wine tasting. Since we did not want to drive through the wine farming area ourselves to pick out some vineyards we thought this offer was just right for us. As announced we were picked up at 09:00 h in the morning in front of our Hotel and were taken to five vineyards around Stellenbosch. The group consisted out of three American men, an American couple, two siblings from Brasil, a Norwegian couple and the two of us. Out of our perspective this tour is a must! There was something new to see, to eat and to discover at every vineyard and if you found your favorite wine you could directly buy it. Part of the tour was a behind-the scenes tour through the production process of Champaign and sparkling wine. 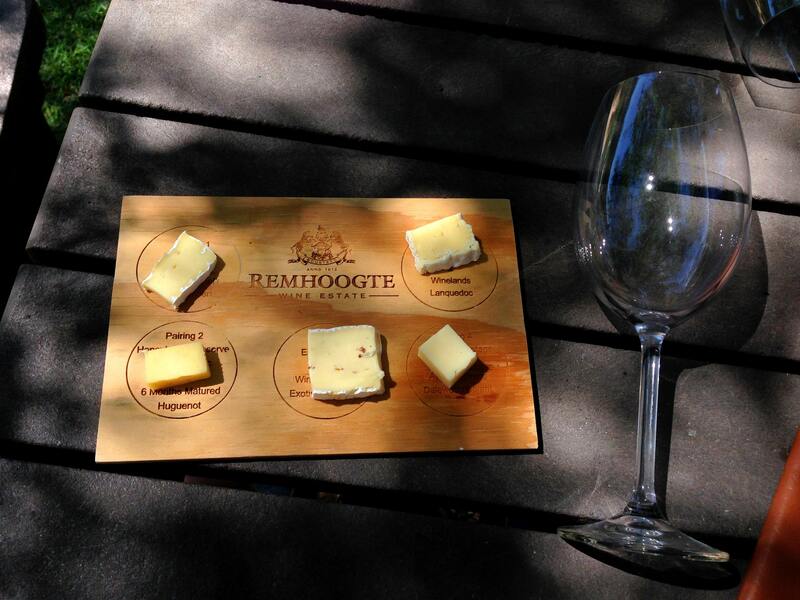 One wine tasting included a cheese pairing, another included lunch and as a “dessert” wine tasting there was a chocolate pairing. Our guide Ian was awesome and the vineyards he took us to very hospitable. This tour was awesome and absolutely well organized and we can just highly recommend it. At the end of the day Ian drove everyone to their accommodation. In total the tour took about seven hours and cost approximately 50,- € per Peron. We spent our last full day in Cape Town down town and in the former blue-collar neighborhood Woodstock. Along and around Albert Road, this district turned into a young and hip district where young uprising designers and start-ups settled down. It is worth visiting the Woodstock Exchange where the offices and ateliers of the various designers are right next to their shops. 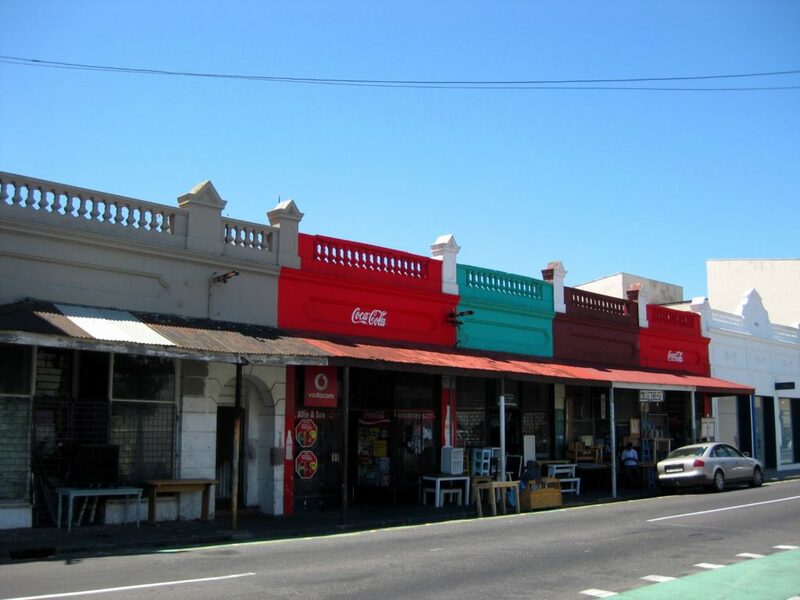 This district is not packed with tourists and offers a great und exclusive way of shopping. All together you can say that the district Woodstock mirrors the aspiring picture of Cape Town. It is visible that things are moving on and the development is progressing. Loaded with a few shopping bags, that we filled up at The Old Biscuit Mill, we went back to the city center and we decided to have our last dinner last day in BOCCA, our “regular” haunt. It was in the beginning of February when my girlfriend and I waited for our train on the platform in the airport. We could still feel the icy coolness of the night on this early morning that started to vanish and announced a cold winter day. It was the time of the day when people went to work with their pale and blank faces. We stood there, well and warmly dressed against the cold air. We stood there with our suitcases and waited on being able to face the nasty weather and surrender to every-day life. We waited to finally unpack our suitcases and leave the vacation behind us. And this time came on that day in February. We stood there, we waited and we surely were the only people on this February 9th that had a smile on their faces. Thank you so much for the mention on your blog. I had a read through the Cape Town article and it seems you really saw the best of the Western Cape on your trip! I hope you’ll be able to return one day and will visit Royale again for more burgers! Thanks so much for the mention. I have forward this on to our marketing team so that they may share your piece on our social media pages! We hope you will visit again soon. We are of course delighted that you liked our restaurant and appreciate the special mention in your blog. We hope to see you again in SA and of course at Transkaroo!